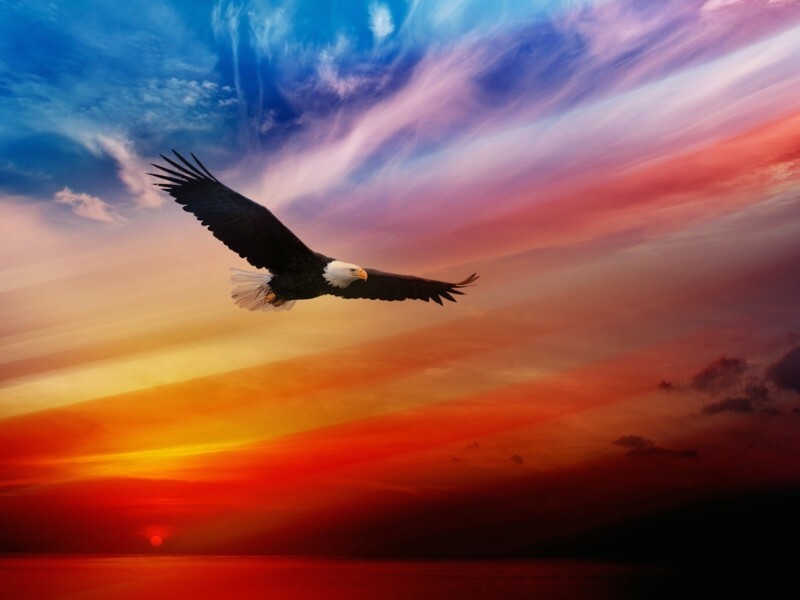 Eagle comes from the east, the place of new beginnings and the rising sun. She soars high in the sky, sees the smallest detail with clarity, and does not lose track of the bigger picture. For Eagle there are no obstacles, only opportunities. She calls us to ascend and to acquire a new perspective in life. I was walking in the bush early this morning and along the ever-changing path of the forest. Some of the path was very rocky and it occurred to me how important it was to be present. Walking, I realized that although the path is difficult at times, it’s only when I move too fast or am too busy in my mind, that I lose sight of what is right in front of me. I may miss a rock and fall, I may miss an opportunity of an easier path to take. Either way, I will learn from my experience. To see my path clearly I need to stay present. If I don’t like where I am, wishing it was different, then I sit still and become silent. I imagine I am Eagle, soaring above it all. I visualize the landscape and see it from a new perspective. I see the mystery, and accept I don’t know what is ahead, but I have learned to trust it will change. The path changes when I understand that where I am in this moment, is perfect. A beautiful read, so inspiring and encouraging, Karen and yes they are amazing birds, soaring to freer spaces and such a wonderful bird. Great post. Welcome Karen and yes so true. This is an amazing post on so many levels, and there are life lessons that your post on the wisdom of the eagle can teach us. I loved the messages in this piece, and especially this quote … “It’s only when I move too fast or am too busy in my mind, that I lose sight of what is in front of me.” In this lightning speed, fast-paced social media influenced world it is easy to miss or overlook important details, as evidenced when we turn on the news or read or hear about the latest incident where this simple lesson was ignored. And I am now off to learn more about Lame Deer. Thank you for this. Karen, you have no idea how much I needed to read this message today. To be able to step back, and sit in silence. . . while things are boiling over. . . and be like the majestic eagle. Thank you my dear. I loved the part: if I don’t like where I am, wishing it was different, then I sit still and become silent. I imagine I am eagle, soaring above it all. I visualize the landscape and see it from a new perspective. Too often we are lost in mazes of our life, and miss the larger picture. When we don’t like where life takes us, we should just take a step back and remember the “bird’s eye” view. Is it not wonderful that more present we are in the current moment, more attention we give to every small detail of this moment, more close we are to the larger picture? In some sense, the larger picture is hidden in these small moments, and more attention we pay to these moments, more we understand the larger picture. Many moons ago, in my first job, our CEO asked each of us at a luncheon what animal we would be. I chose eagle. I think he thought I was trying to impress him–he poo-pooed the idea, saying eagles were mean. But I wasn’t thinking in that sense–it was the ability to soar, the freedom, the bird’s eye view, that I loved. Eagles are protectors. This story puts it perfectly. Thank you for rounding out the moment for me, decades later:).